Sore Mainsheet Hands – Try Larger Blocks……!! Some of us are getting older, (over 40 for example!) and are getting the occasional bout of sore fingers, sore joints, sore hands etc. At the Dinghy Show, Mike Thompson delighted me with the notion that trying larger diameter blocks seem to help. Back in the sixties, when we didn’t have the technology to use ball bearing blocks, dinghy mainsheet blocks “went large” – spearheaded by the then World Flying Dutchman Champions, John Oakley and David Hunt. The generally accepted idea was that it was the right thing to do to reduce rolling friction. Then small ball bearing races, and nylon, came along and we went to mini ball bearing blocks. We generally seem to be standardising on 40mm blocks for mainsheets, but Mike has tried 57mm Harkens to very good effect. He says it reduces loads on the hands substantially. Looking at the photo, Mike has gone up a size for the final ratchet too. The interesting thing to me is “why?”. If you have a child in the sixth form doing A level Physics, you might ask them for us. Frictional differences now will be tiny. So maybe it simply takes much more effort to wrap modern sheets around smaller diameter curves, than for larger radiuses?? 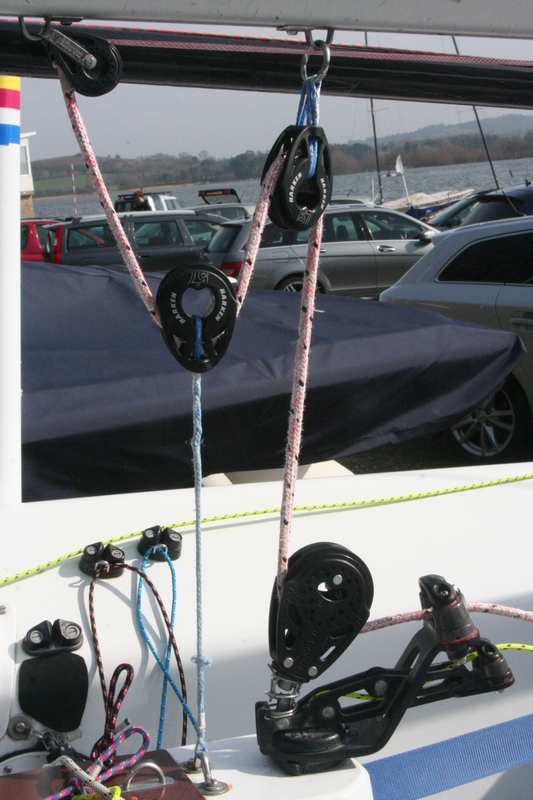 This entry was posted in Boat Fit-Out, Ownership and tagged flying fifteen, larger, mainsheet block, reduce, reducing, sheet tension, size, smaller by flyingfifteen. Bookmark the permalink. Interestingly it does make a bit of a difference, I sail on a formula one and the skipper used some old ratchet blocks instead of plain bearing blocks. Main sheet wouldn’t run out in light wind bear always!